A brief review of the current status of the inland fisheries of Africa was presented as document CIFA/72/8 to the First Session of CIFA (N'Djamena, 1972). This was revised as document CIFA/75/Inf. 6 for presentation to the Second Session (Accra, 1975). Since then more information has been included to produce an expanded document on the inland fisheries of Africa. This document is intended for circulation and approval by the relevant authorities in the various African states after which it will be finalized to form part of the FAO series on World Appraisal of Inland Fisheries. CIFA Occas.Pap., (7): 69 p.
Inland fisheries. Hydrology. Fish catch statistics. Freshwater fish. Yield. Yield predictions. Africa. Report of each session, in English and French. Selected scientific and technical papers, including some of those contributed as working documents to sessions of the Committee and reports of subcommittees, working parties study groups and correspondence networks. Published in English and French. Papers of general interest to the Committee. Published in the language submitted, either in English or French. 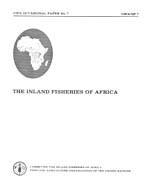 CIFA/OP1 The relationship of yield to morpho-edaphic index and numbers of fishermen in African inland fisheries. Relation entre la production, l'indice morpho-édaphique et le nombre de pêcheurs des pêcheries des eaux continentales d'Afrique (1974). CIFA/OP3 Some general and theoretical considerations on the fish production of African rivers. Quelques considérations générales et théoriques sur la production halieutique des cours d'eau africains (1974). CIFA/OP2 Manuel de construction artisanale d'embarcations. Handbook of artisanal boatbuilding (1975). CIFA/OP5 A bibliography of African freshwater fish. Bibliographie des poissons d'eau douce de l'Afrique (Suppl. 1 - 1968 – 1975). CIFA/OP6 Bibliography of fisheries and limnology for Lake Tanganyika. Bibliographie sur les pêches et la limnologie du Lac Tanganyika (1978).